1Institute of Engineering and Technology, Autonommous University of Juarez City, Ciudad Juarez, México; 2Instituto of Design and Art, Autonommous University of Juarez City, Ciudad Juarez, México; 3Advanced Materials Research Center, CIMAV, Chihuahua, México; 4Institute of Biomedical Sciences, Autonommous University of Juarez City, Ciudad Juarez, México. Copyright © 2013 Imelda Olivas-Armendariz et al. This is an open access article distributed under the Creative Commons Attribution License, which permits unrestricted use, distribution, and reproduction in any medium, provided the original work is properly cited. 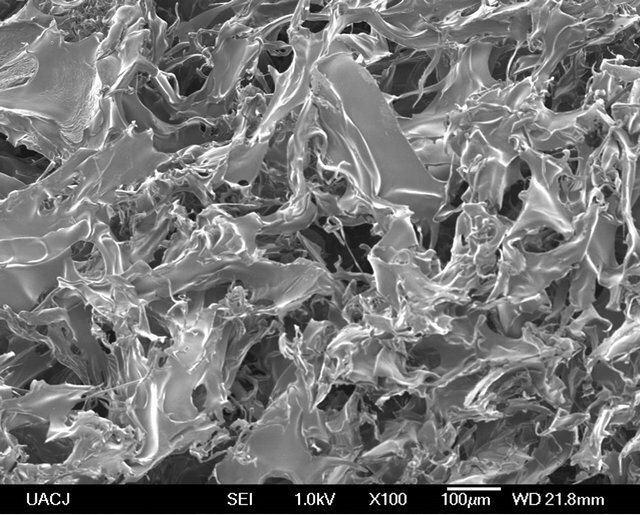 In this work the influence of multiwalled carbon nanotubes (MWCNT) on mechanical properties was evaluated also the osteoinduction mechanism in Chitosan/MWCNT composite is reported. The morphology and the mechanical properties of the scaffolds were controlled by varying solvent ratios, quenching temperatures and carbon nanotubes concentration. In vitro cell culture of Sprague-Dawley rat’s osteoblasts was used to evaluate the phenotype expression of cells in the scaffolds. The presence of MWCNT in a chitosan matrix improving its mechanical properties and sustain osteoblast growth and differentiation that represent a potential application of the Chitosan/MWCNT as biomaterial for bone tissue engineering. The repair and replacement of injured bone is a challenge treatment in medicine . It is clinically relevant to develop a scaffold that can support and stimuli the tissue formation in an injured organ. Tissue engineering is an interdisciplinary discipline that use the knowledge of cells, engineering materials, and suitable biochemical factors to create artificial organs and tissues, or to regenerate damaged tissues . These strategies demand new materials that are capable of interact with natural tissues, mechanically and biofunctionally . These materials must have high porosity, interconnected pores to permit cell migration, tissue infiltration and vascularization. Bone is composed by collagen and hydroxyapatite, so a material to replace it, should mimic the natural function of bone, allowing cells to proliferate and differentiate and also, should not be toxic . For this reason, optimal scaffold degradation kinetics, comparable with the rate of tissue formation, is a key aspect in preserving the mechanical response of the hybrid tissue at the defect site and precise control over morphology and structure [3,4]. Several efforts have investigated the use of biodegradable polymers, for instance, hydroxyapatite/poly (caprolactone) . 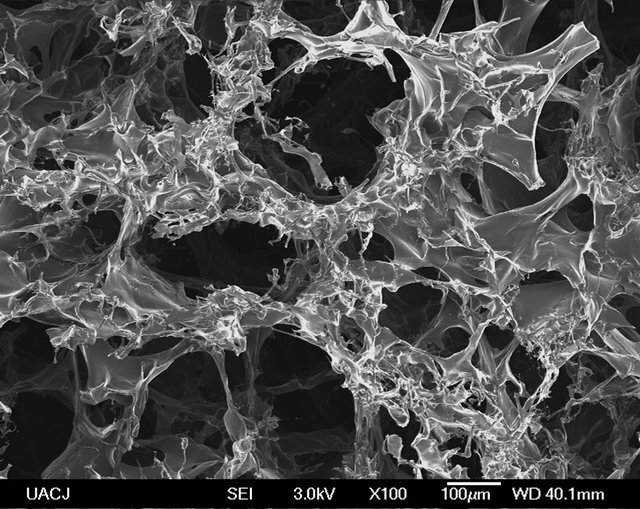 Several methods have been used to produce porous scaffolds, such as foaming, gel casting, polymer replication/impregnating, solvent casting, particulate leaching and phase separation , computerized design and manufacture of three dimensional (3D) architectures . Materials used in biomedical applications, must be biocompatible and developed good mechanical performance . Certain morphological characteristics are required to ensure cell adhesion, molecular transport, vascularization and osteogenesis. Small pores permit hypoxic conditions and induce osteochondroma formation and large pores induce a well-vascularized network and osteogenesis . Chitosan (Ch) is the principal exoskeletal component in crustaceans . It is a promising polymer due to its biodegradability, antimicrobial and antifungal activity, non-toxicity and low permeability to oxygen [7-9]. Additionally, it has excellent membrane forming ability, high permeability to water, and good mechanical properties . Also, chitosan contains hydroxyl and amine groups, so it could form hydrogen bonds [8,11]. It is a cationic polymer, composed of D-glucosamine and N-acetyl-Dglucosamine units linked in a β (1→4) [7,10], that it is obtained by partial deacetylation of chitin extracted from the shells of crustaceans . Chitosan has a good solubility in some organic acid and enough resistance in alkaline solutions . On the other hand, carbon nanotubes (CNTs) have been used in tissue engineering as a candidate for bone tissue engineering scaffolds due to its excellent mechanical properties, large surface specific areas and high electronic conductivity [8,13] as well as magnetic properties . It is also considered that is a suitable material for tissue engineering . Carbon nanotubes are mainly non-biodegradable, but carboxylated or hydroxylated carbon nanotubes are water-soluble and could be eventually cleared from systemic blood circulation through renal excretion route. Also, it was reported that MWCNT were used to improve the mechanical properties of some biodegradable materials and at the same time were investigated as a material that can promote cellular and extracellular responses at surface . The length of the nanotubes varies from hundred nanometers to micrometers, with diameter of 0.4 - 2 nm, for single-walled carbon nanotubes and 2 - 100 nm for MWCNT . Due to its size, the use of carbon nanotubes in transporting and delivering atoms or molecules, such as drugs or devices, has been used recently with success . Chitosan/carbon nanotubes composites were developed previously in our lab with composition of CNTs from 2% to 10% in wt showing a clear influence of the amount of CNTs in the mechanical properties [16,17], working with less than 0.01% of MWCNT getting non uniform pores and 80% of porosity and better proliferation than chitosan alone. Several efforts have been made to introduce MWCNT in a polymeric matrix, using polycaprolactone for bone tissue engineering . It is important to evaluate the interactions between osteoblasts and scaffold material in order to know how osteogenic cells respond to these materials. Chitosan/CNT scaffols has been mainly evaluated in immortalized cell lines such as osteoblast-like MG-63 cells, mouse fibroblasts or osteogenic cells. Nevertheless, these models can modify the expression of cells markers. 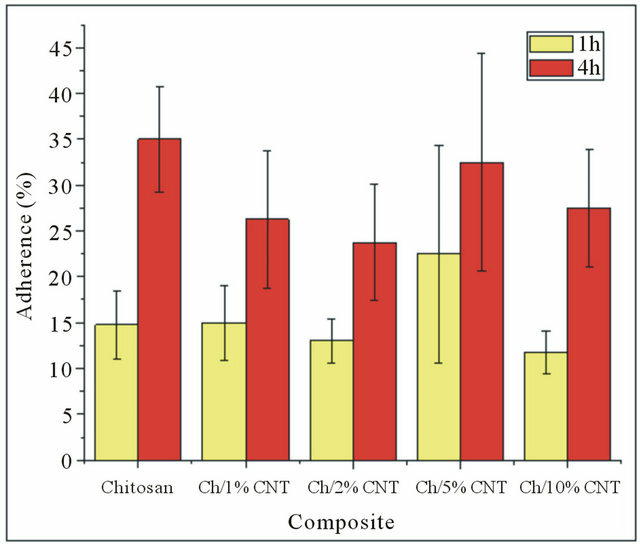 In order to evaluate the potential applications in tissue engineering chitosan/CNT composites were produced using thermally induced phase separation techniques (TIPS). In this research the behavior of primary osteoblasts cultured on the scaffolds was evaluated by testing the capability of biomineralization; alkaline phosphatase (ALP) activity, cell viability and sialoprotein expression of osteoblasts in the biomaterials were also evaluated. To prepare the Ch/MWCNT composites, chitosan of high molecular weight and ³85% deacetylation was purchased from Sigma Aldrich (United States). Ethanol was supplied by CTR Scientific (Mexico) and Glacial Acetic Acid (Mallinckrodt, United States) was used as a solvents. Chitosan/MWCNT composites with different compositions were prepared in our laboratory according to a previously used method reported by our group . Briefly, MWCNT previously treated in 4 M HNO3 solution, washed with distilled water and dried for 2 h in an oven at 100˚C, were used to prepare a CH/MWCNT solution. Different compositions of MWCNTs were placed in 1 M acetic acid solution and they were dispersed by sonication for 5 min at room temperature. Afterwards, 2 g of Chitosan was added slowly and the mixture was stirred at 1700 rpm until a homogeneous mixture was obtained. Then, the mixture was frozen at −40˚C and later the solvent was extracted by a freeze-drying system for 48 h. The composites were neutralized in an aqueous solution of NaOH-CH3CH2OH (0.5 wt% NaOH was dissolved in 80% ethanol aqueous solution) at −20˚C for 12 h, then it was immersed in pure ethanol for 12 h at −20˚C, after that, it was washed with distilled water and dried in a freeze dryer. where ρ is their apparent density (simple dimension and weight) and ρo (non porous sample) is the bulk density. Mean values were obtained with measurements of three samples of each composite. RSA III (Rheometrics Analyzes System) TA was used in static mode at 37˚C and a frequency of 6.2832 rad/s for all samples. Disks of approximately 10 mm in thickness and 25 mm in diameter were mounted in a compression clamp. At least three samples of each composition were measured and the results were averaged. Rats Sprague Dawley approximately 14 days old were used for the isolation of osteoblasts in accordance with previous used method . National guidelines for the care and use of laboratory animals were observed. Briefly, calvaria bones were dissected, and cleaned with a 70% ethanol solution. Then they were incubated with 2.5 mg/ mL of collagenase (type I) in phosphate-buffered saline (PBS) at 37˚C. Then, cells were dissociated from partially digested bone fragments by repeated mechanical pipetting. The cells were collected under sterile conditions and washed three times with PBS before counting with a hematocytomer. The osteoblasts were inoculated in a culture plate. The α-MEM was supplemented with 10% fetal bovine serum (FBS). To this solution 0.05 mL of penicillinstreptomycin was added per mL of solution, prepared with 10,000 units/mL of sodic G penicillin and 10,000 units µg/mL of streptomycin sulphate in a saline solution at 0.85%. To this solution 2.16 mg/mL of β-glycerophosphate and 0.5 mg/mL of ascorbic acid were added. Scaffolds (1.0 cm × 1.0 cm × 0.5 cm) were placed in each well of a 24-well culture plate. Osteoblasts were pooled into the scaffolds at a density of 200,000 cells and cultured in the 500 µL of prepared solution of α-MEM supplemented with 10% fetal bovine, antibiotics, β-glycerolphosphate and ascorbic acid in an incubator (37˚C with 5% CO2). The medium was replaced every 48 h and cell cultures were finished at 7, 14, 21 and 28 days. After being cultured for various number of days, the samples with attached cells were rinsed twice with PBS (pH 7.4), and immersed in PBS containing 3% Glutaraldehyde for 4 h to fix the cells, followed by rinsing twice with PBS for 10 min. They were dehydrated through a series of graded ethanol solutions (30%, 50%, 70%, 90% and 100%) for additional 30 min, then they were allowed to air-dry overnight. The dry cell-seeded scaffolds were mounted on aluminum stubs, with a line of graphite and examined under a scanning electron microscope. The alkaline phosphatase (ALP) activity of the differentiated osteoblasts on the scaffolds was measured in control and test cultures that were harvested on days 14, 21 and 28. Once each period was finished, the samples were washed twice with PBS. Polymers not seeded with cells were stained as negative controls. The osteoblasts were lysed with 3 ml of 1% Triton X-100 in DEPC-treated water and three freeze-thaw cycles at −70˚C. The alkaline phosphatase activity in the lysed cells was determined using an alkaline phosphatase substrate assay kit (Pierce biotechnology, Monterrey, Mexico) with p-nitrophenyl phosphate as substrate. It was prepared a standard curve using p-nitrophenol and adding 2 M NaOH according to the manufacturer’s instructions stopped the reaction. The alkaline phosphatase activity was measured by spectrophotometry (absorbance at 405 nm) (Microplate spectrophotometer Bench mark plus, BIO-RAD). Each sample previously seeded with osteoblasts was gently rinsed with PBS and the number of unattached cells in the rinsed solution was quantified by microscopic observation using a hemocytometer. Parallel samples of n = 3 were used for each group of the scaffold composition. 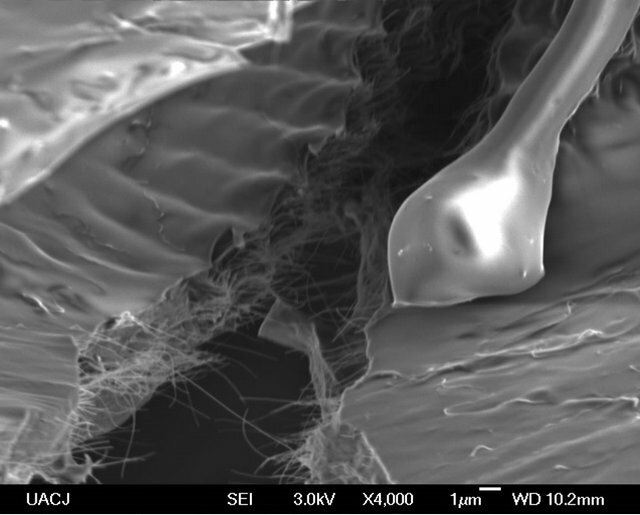 The adhesiveness of the osteoblasts was expressed by the percentage of osteoblasts trapped in the scaffolds to the total cells seeded. Alamar blue staining was used to measure cell viability. This assay evaluates the products of the redox reactions occurring in mitochondria of viable cells . The dye was added in the sample-containing wells (final concentration 10% in medium v/v) and the cells were incubated at 37˚C for 4 hours. Absorbance was measured at 530 nm and 590 nm using a microplate reader. It was used as a calibration curve generated previously with a number of cells known at 570 nm. The intensity of blue color obtained was directly proportional to the metabolic activity of the cell populations and inversely proportional to the cytotoxicity of the scaffolds . All spectra were recorded using 100 scans and 16 cm−1 resolutions. The X-ray diffraction patterns of the samples were analyzed between 2˚ = 5˚ and 2˚ = 80˚ with a step size of 2˚ = 0.02˚ in an X-ray diffraction instrument in continuous mode (PANanalytical X’Pert PRO). Total RNA was isolated from culture cell with biomaterial incubated using TRIZOL method. The First strand cDNA synthesis was performed by reverse transcription using ImProm-II TM Reverse Transcription System Kit (Promega) and (dT) 12 - 18 primer following the product’s instruction manual. cDNA of cells post-incubation at 3, 7, 14 and 21 days, were measured by RT-PCR using specific primers. The amplifications were performed in a 25-ll reaction volume containing 100 ng of cDNA template, 12.5 ll Master mix (Promega), 1.0 ll at 20 mM of each of the forward and reverse primers (the primers used codified to Sialoprotein and ALP). The cycling number of PCR was optimized to 30 cycles. The cycling protocol was 1 cycle of 94˚C for 5 min; 29 cycles of 94˚C for 30 s, the temperature used depended on the evaluated primer. Primers were used to amplify GADPH as housekeeping gene. The cycling protocol was 1 cycle of 94˚C for 5 min; 29 cycles of 94˚C for 30 s, 60 for 1 min and 72 for 1 min followed by 1 cycle of 72˚C for 10 min. Data analysis of the RT-PCR was performed by densitometry using the software EDAS-290 Kodak. The data obtained was evaluated for statistical significance using the unpaired, two-tailed T-test. The results are reported as mean ± SD and the differences observed between composite results were considered significant at p < 0.05 . The Chitosan/MWCNT composite scaffolds were fabricated by the thermally induced phase separation method. In Figure 1 cross-sectional SEM micrographs of the scaffold and the distribution of MWCNT in the polymeric matrix are showed. 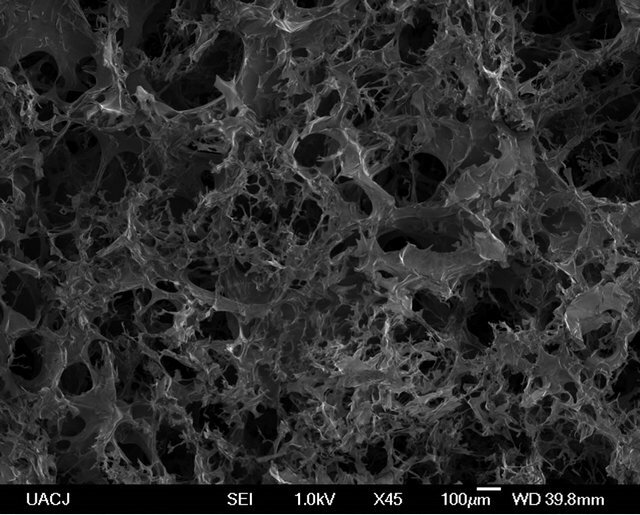 There is a highly interconnected porosity and the MWCNT were embedded in the chitosan and appeared uniformly distributed throughout the scaffold. The porosity and pore size is shown in Table 1 and shows that with the increasing of CNT content the average pore size decreased. The porosity of the chitosan with 1% CNT was 95.5% compared to 95.4% of the control indicating that there is no significant change in porosity. This result indicates that the pore size could be tuned down by increasing the CNT content to lower microns without changing the overall porosity. This means that it is possible to increase the surface area of the scaffold, to improve the cell attachment. It was reported that osteoblasts grow effectively in scaffolds with pore size lower than 100 µm . 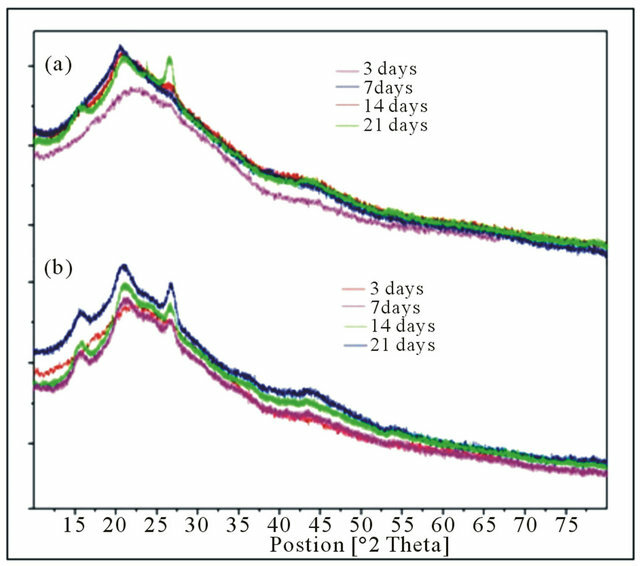 The degradation tests of the chitosan and chitosan/ MWCNT composites (Table 1), after 6 weeks, showed that chitosan degradation rate was faster than the chitosan/MWCNT composites; the degradation rate decreases when increasing MWCNT concentration, being the composite containing 10% of MWCNT that obtained lower degradation rate. These results showed that the MWCNT gives more stability to the composites, thereby allowing retention of their original morphology and the degradation rate decrease as the concentration increase. Figure 1. SEM images of Chitosan (a), chitosan/1% MWCNT (b), chitosan/2% MWCNT, and chitosan/2% MWCNT composites prepared by thermal induced phase separation. Table 1. Characterization measurement of the porosity; average pore size, degradation% with PBS, and compressive modulus of the composites of chitosan with and without MWCNT. strate play a crucial role in the formation of cell-substrate adhesion complex, cell proliferation and differentiation . Cell adhesion, in tissue engineering, depends strongly on the physical and chemical properties of the biomaterial surface . Figure 2 shows the adherence percentage of the composites at 1 and 3 hours. Observed that in the 1 and 4 hour there is no significant difference, but finding a significant difference between 1 and 4 hours for all composites except the composite containing 5% of MWCNT. On the other hand, in the SEM images (Figure 3) it can be seen that composite containing 2% of MWCNT retain their structure when they are hydrated with culture medium. The images at 3 days of culture reveal the presence of cells adhered and spread on the substrate. There are also indications of a migration from the pores of the composite. Moreover, at 3 and 7 days of culture nucleation and growth of hydroxyapatite crystals were observed, the size and shape of the crystals was uniform, showing aggregates randomly distributed through the matrix. These results are consistent with those obtained by other researchers, in which the calcification and crystal formation (in early stages) is attributed to the extracellular matrix proteins, which can be placed in the culture medium or secreted by resident cells . Finally, hydroxyapatite crystals of hexagonal morphology as reported in the literature  were observed at 14 and 21 days. The SEM images with the EDS analysis confirms that cell cultures formed mineral deposits, which is a primary function of osteoblast cells. The EDS analysis of the surface of cell clusters in the early stage of culture (Figure 3(a)), shows the presence of elements such as phosphorrus, calcium, and sodium that are part of the inorganic composition of bone. After several days of culture the same elements were found as well chloride ions that are an important part of the hydroxyapatite and play an important role in bone remodeling function . At 21 days of culture elements such as: calcium, phosphorous, carbon, oxygen, magnesium, chlorine, and potassium ions that are mineral parts of the hydroxyapatite crystals were present. Elements such potassium and chloride in cultures at 14 and 21 days and its absence in the sample of 3 and 7 days is due to the mineralization with the consequent formation of hydroxyapatite crystals that occurs progressively, so that in early stages of cultivation appeared amorphous apatite as can be appreciated in SEM pictures and XRD pattern of composites (Figure 4), time after the interaction has been stabilized between the atoms of calcium, phosphorous, oxygen, and carbon resulting in the formation of hydroxyapatite with its mineral composition which contains elements such as chlorine and potassium. These results show that these kinds of composites containing MWCNT are suitable for deposition of a mineralized matrix similar to the bone. Figure 2. Osteoblasts adherence in the composites at 1 and 4 h.
Figure 3. SEM micrographs and EDS analysis of composite containing 2% of MWCNT at different periods of time. (a) 3 days, (b) 7 days, (c) 14 days, and (d) 21 days of culture. Figure 4 XRD spectrum of composites containing 5% (a) and 10% (b) of MWCNT at different periods of time. Characteristic peaks of hydroxyapatite (22˚, 26˚, 40˚, 45˚, and 50˚) and MWCNT (54˚) are observed, in the scale of 2q. Figure 5. Cell number in the composite at 3, 7, 14, and 21 days of culture. than the chitosan. 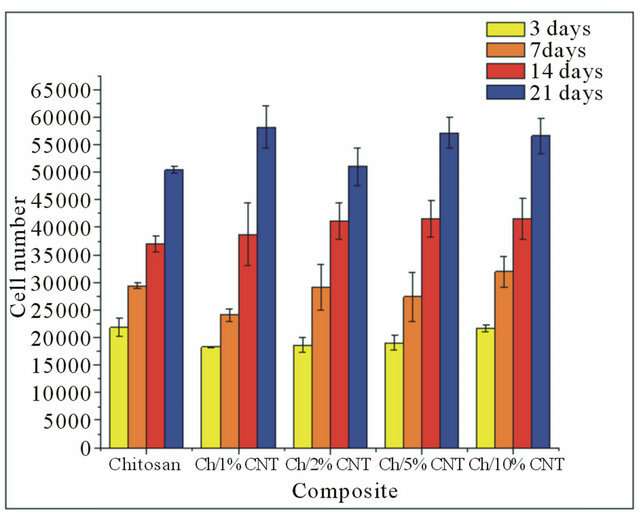 Nevertheless at 21 days of culture the number of cells was significantly higher to the chitosan in the composite containing 1%, 5%, and 10% of MWCNT, while the composite containing 2% of MWCNT was similar to chitosan. 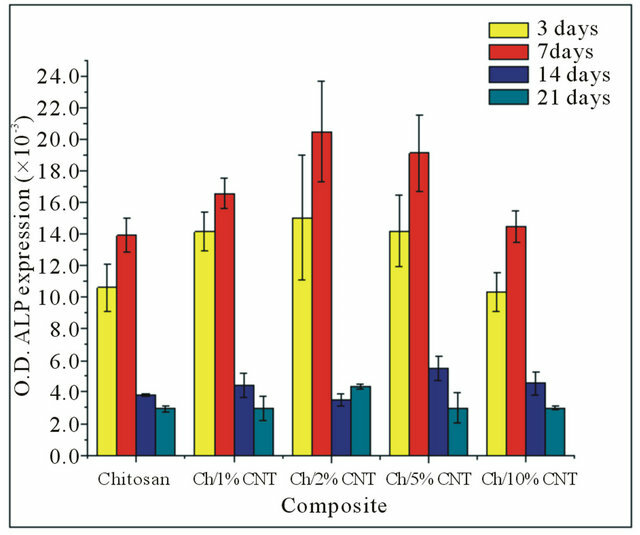 All composites showed an increasing trend of cellular proliferation, with a significantly higher proliferation rate between 14 and 21 days of culture of the composites and chitosan; contradicting the results reported by other researchers, who reported a decrease in number of cells at 14 and 21 days of culture. This can be attributed to the stop cell proliferation stage and the beginning of the osteoblast differentiation that are trapped in the mineralized extracellular matrix, differentiating into osteocytes . The results suggest that the presence of 1%, 5% and 10% of MWCNT in the composite benefit cellular attachment and proliferation as well enhance mechanical properties. Figure 6. ALP expression of the cells in the composite. Figure 7. Gene expressions of sialoprotein and ALP on composites at 3, 7, 14, and 21 days of culture. MWCNT promotes osteoblast differentiation . To determine the expression of makers genes, ALP and sialoprotein, total RNA was isolated at 3, 7, 14 and 21 days from primary osteoblasts cells cultured on the composites (Figure 7). The sialoprotein, a highly phosphorylated protein rich in polyglutamate repeats, is an effective point for nuclei hydroxyapatite in vitro and has an important function in the mineralization process [27,28]. It was expressed by all composites loaded with osteoblast at 3, 7, 14 and 21 days. Moreover, ALP was expressed by all samples during the study period, associated with the deposition of extracellular matrix. At 21 days when the mineralization occurs the ALP expression decrease. Samples containing 1%, 2%, and 5% of carbon nanotubes showed more ALP expression than the other samples. This result is in agreement with the behavior showed during the biochemical analysis of ALP activity. MWCNT can be incorporated in a Chitosan Matrix improving its mechanical properties considerably, also its presence sustain osteoblast growth and differentiation that represent a potential application of the Chitosan/MWCNT as biomaterial for bone tissue engineering. The authors acknowledge the financial support of FOMIX-Gobierno del estado de Chihuahua through project CHIH-2010-C01. Also, we greatly appreciate the support of Laura Elizabeth Valencia and Susana García. S. R. Kanatt, M. S. Rao, S. P. Chawla and A. Sharma, “Active Chitosan-Polyvinyl Alcohol Films with Natural Extracts,” Food Hydrocolloids, Vol. 29, 2012, pp. 290- 287. 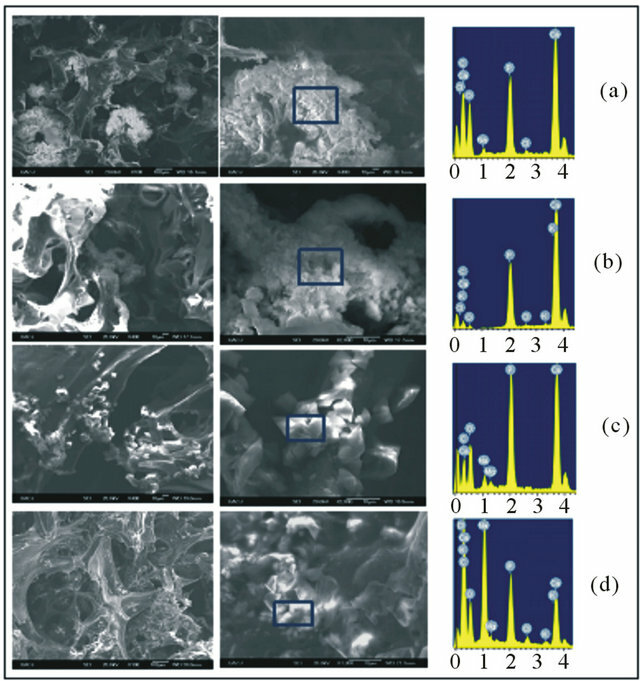 D. B. Baskar, R. Balu and T. S. Kumar, “Mineralization of Pristine Chitosan Film through Biomimetic Process,” International Journal of Biological Macromolecules, Vol. 49, No. 3, 2011, pp. 385-389. M. V. García-Garduño and J. Reyes-Gasga, “La Hidroxiapatita, su Importancia en los Tejidos Mineralizados y su Aplicación Biomédica,” Revista Especializada en Ciencias Químico-Biológicas, Vol. 9, No. 1, 2006, pp. 90-95. A. Kierszenbaum, “Histología y Biología Celular,” Elsevier España.